ChIP-Seq Spike-in corrects for technical variation that occurs as a result of the multistep ChIP/ChIP-Seq protocols. The addition of two key reagents, Spike-in Chromatin and Spike-in Antibody to standard ChIP reactions provides a means to track sample variation and normalize the data appropriately. The need to normalize whole-genome datasets has become evident in the RNA-Seq community, where spike-in is becoming common practice. The new system is easily implemented and universally applicable to any ChIP experimental set-up. 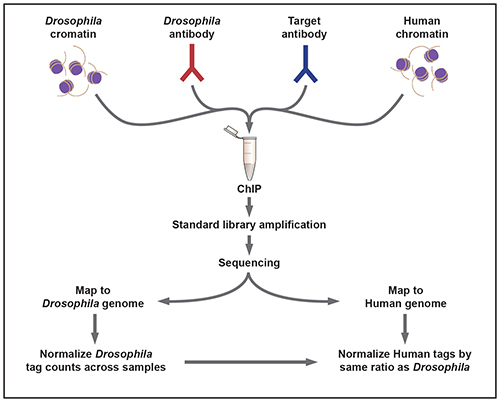 The ChIP Spike-in Chromatin and Antibody reagents and protocol are available for purchase together as well as being incorporated into a variety of Active Motif’s end-to-end ChIP-Seq services.